If the Miami Dolphins were underdogs the previous year in their Super Bowl showdown with the Washington Redskins, they were firm favorites entering the eighth Super Sunday and played like it from start to finish. ​In a fog-shrouded Rice Stadium in Houston, Texas, bruising rushing touchdowns of five yards and one yard from Larry Csonka and Jim Kiick respectively gave the Dolphins a 14-0 first quarter lead. A field goal in the second period stretched the advantage to 17-0 at the end of the first half. The contest was one-sided throughout the first thirty minutes, and while they only added one more touchdown in the second half, the Minnesota Vikings were rarely a threat the defending champions. 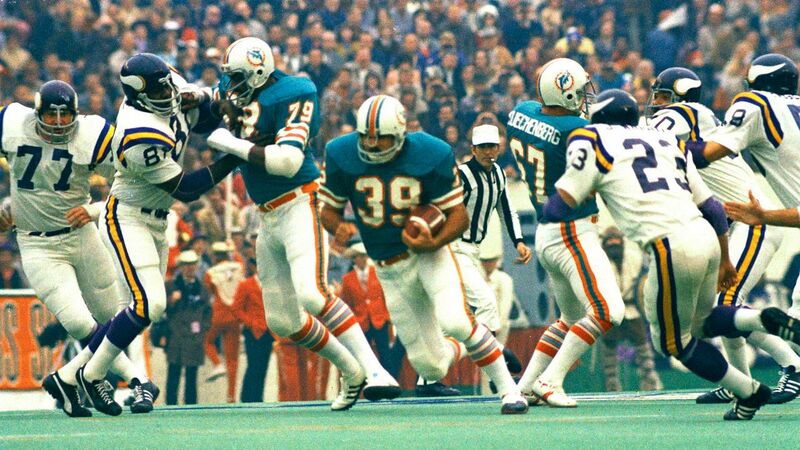 The aforementioned Csonka would scoop the MVP award as he rushed for 145 yards on 33 carries and two scores, and while fellow running backs, Mercury Morris and Jim Kiick would carry the ball 11 and 7 times respectively, it was Csonka's bruising running that hammered the eventually frustrated and worn down Purple People Eater defense. The players shake hands before the contest begins. Rice Stadium - the venue for the eighth Super Bowl. 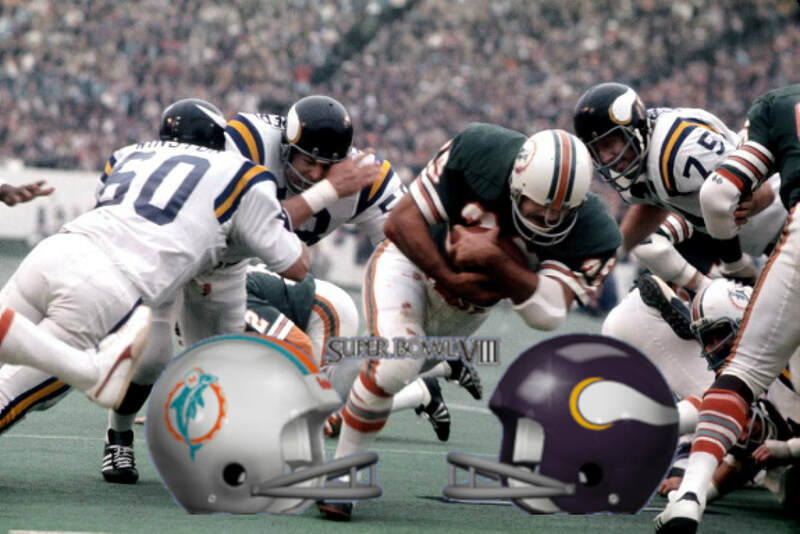 Super Bowl VIII was the first contest in which an original AFL franchise entered the contest as the favored team. 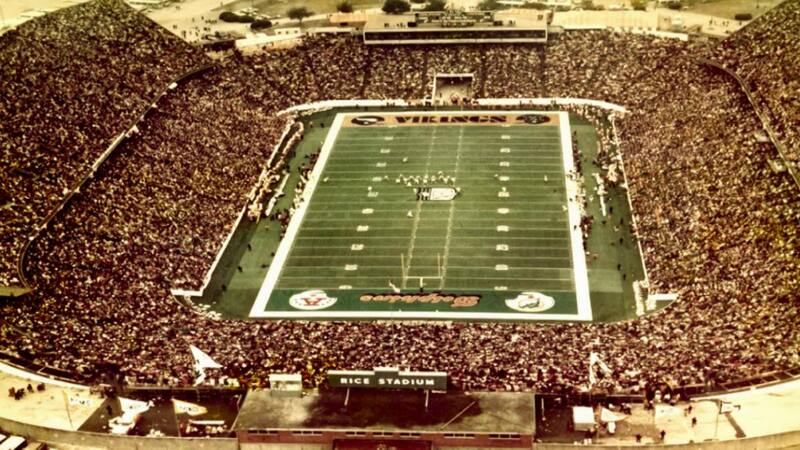 The contest was played at Rice Stadium and was the first time a stadium was used that didn't belong to a team from either the NFL or the AFL (the Houston Oilers played their home games at the Astrodome). 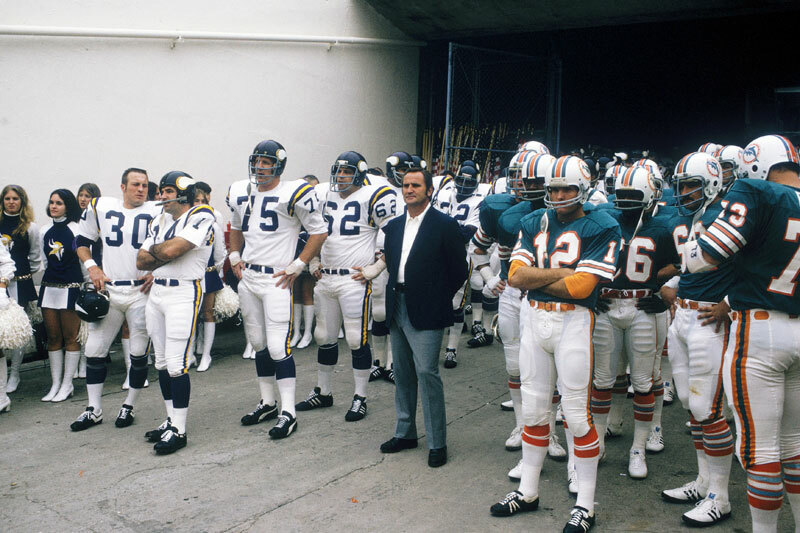 Super Bowl III MVP, Joe Namath, would make another big game prediction that proved to be accurate when he stated during the build-up to the game that, "If Miami gets the kickoff and scores on the opening drive, the game (will be) is over!" They did, they did, and it was. Super Bowl VIII was played with a striped football - the only time a striped football has been used in a Super Bowl game. Bizarrely, the Miami Dolphins had players wearing two separate logos on their helmets. Although the difference was minimal, some adorned the logo used from 1969-1973, while others had the new, updated logo that was introduced prior to the 1974 regular season. 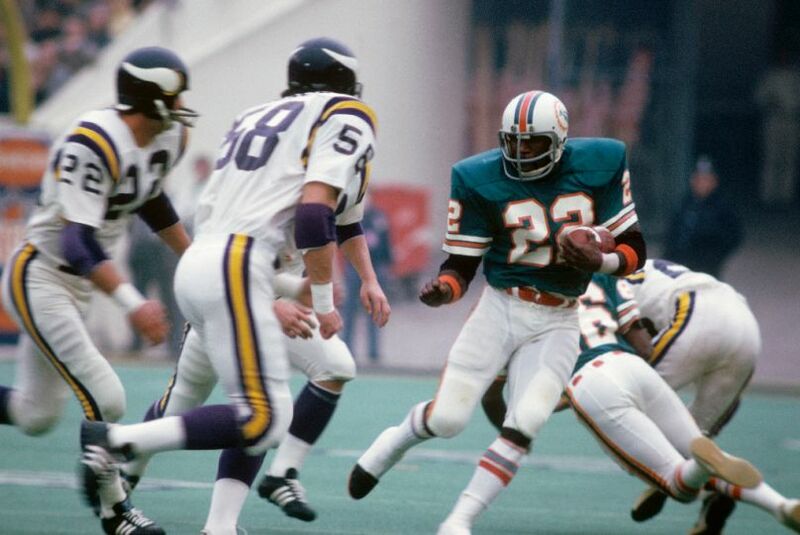 Mercury Morris was a more elusive runner than the bruising Larry Csonka.